VATICAN CITY (CNS) — More than a “decorative presence” at large parish functions, Catholic Scouts and Guides are called to contribute fervor to the evangelizing mission of the church by building bridges through dialogue, said Pope Francis. 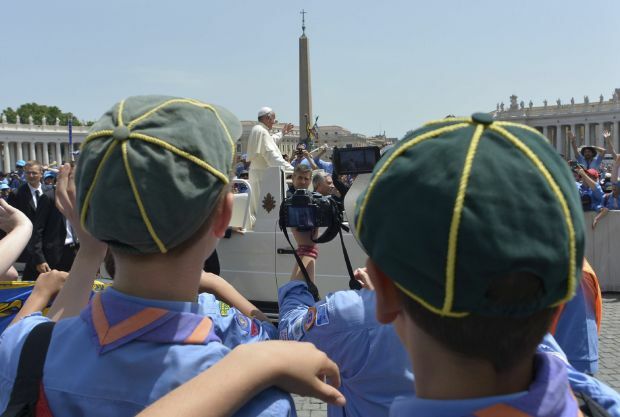 More than 80,000 children and adult members of the Italian Catholic Guiding and Scouting Association gathered under the hot sun in St. Peter’s Square June 13 for a short but festive rally with Pope Francis. Scouting can bring to the church “a new capacity for dialogue with society,” he said, but only if groups do not lose contact with their local parishes, where they are based. “You are called to find a way to integrate yourselves in the pastoral life of the local church, establishing relationships of esteem and collaboration at every level, with your bishops, pastors and other priests, with the educators and members of other church associations present in the parish and in the same territory; and do not satisfy yourselves with a ‘decorative’ presence on Sundays or on big occasions,” he said. He noted that religion has been a fundamental aspect of Scouting since its origins. There is not “a religious side” and a non-religious side to Scouting, he said. Rather, the movement is “based on religion, that is, on the awareness of God and his service,” he said, citing the founder Lord Baden Powell.